﻿ The Aluminium Story, its development, benefits and uses. Corex honeycomb is made of 100% aluminium. 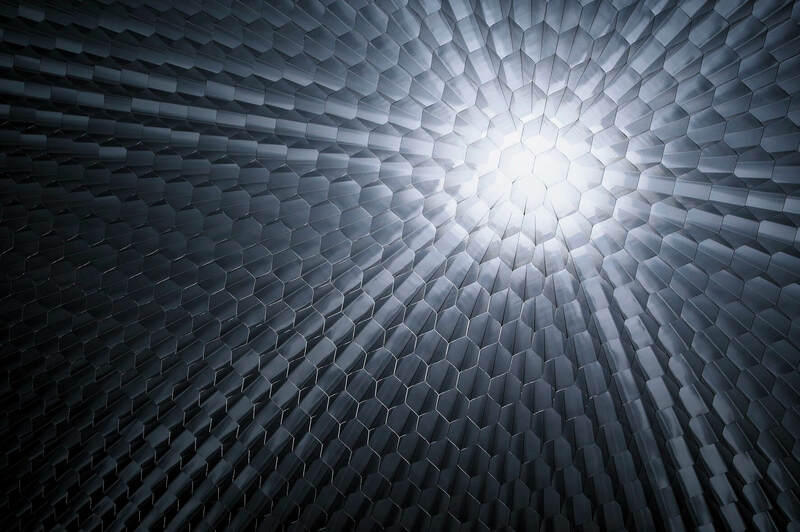 Aluminium honeycomb is chosen for its excellent strength to weight ratio and used extensively in the motorsport, marine, architecture and aerospace industries. Why aluminium? How was this material discovered and what are its benefits? The following article answers these questions and shows the range of processes it can go through to extend its use. In the form of its ore, bauxite, aluminium is the third most common element in the earth’s crust, exceeded only by silicon and oxygen. It forms 8% of the Earth’s crust. Global deposits of bauxite are sufficient for usage for the next 300 years. Over 200 million tonnes of Bauxite are mined annually worldwide. As an area is mined for bauxite, it is rehabilitated annually. Aluminium, the metal, was not discovered until the 19th century; but its compounds were used by the ancient civilisations of Egypt and Assyria. The scientist, Sir Humphrey Davy (1778-1829) is thought to have first discovered aluminium. The chemical process of extraction, discovered by scientists in Denmark, France and Germany was difficult and expensive and only a small amount could be extracted, making it more expensive than gold and platinum. In 1886, Paul Heroult in France and Charles Hall in the USA independently discovered the electrolytic process to make aluminium, which is still used today. The industrial production of aluminium began in 1888 at factories in France, USA and Switzerland. There is a growing demand for aluminium globally, with demand in 2020 expected to exceed 70 million tonnes. 40% of aluminium is produced using clean, renewable hydro-electric methods. The power required to produce primary aluminium has fallen dramatically in recent years. Electricity consumed in aluminium smelters has reduced by 1/3 since the 1950s and by 10% since 1990. The most widely used process for aluminium products. This is produced by rolling aluminium ingots into sheets- even as thin as a chocolate wrapper. Rolled products include drink cans, foil containers, car bodies, building cladding and aircraft wings. The aluminium is squeezed through dies to create lengths of accurate shapes, simple or complex, ready for use. This produces an infinite range of shapes, extrusions can be found in almost every aspect of life. The manufacture of 1 tonne of aluminium extrusions in Europe now requires 30% less energy than in 1998. Aluminium can be cast into very accurate and complex shapes. Low weight and high strength castings are ideal for engine components. Forgings are very high strength components and include aircraft landing gear. Aluminium castings and forgings can be found in most transport applications, including cars, trains, aircraft and ships. The low weight also means less fuel. Aluminium can be enhanced with decorative and protective finishes. Extremely tough anodised and powder/ paint coatings can be very long lasting, carrying 20-year guarantees. Many finishes have low environmental impact and can be recycled easily. Finishes are widely used in architecture, transport, packaging, household appliances, jewellery and furniture. Widely used in advanced composite materials for aerospace and motor racing, lightweight aluminium foam panels and components. They have reflective qualities used in metallic paints, inks and cosmetics. Also used for brake and friction linings. Aluminium can be repeatedly recycled without loss of value or properties. The recycling process takes only 5% of the energy used to make the primary aluminium. Huge reductions in CO2 can be achieved by recycling, and using lightweight aluminium in transport. In Europe, about 50% of all aluminium used to make drink cans and other aluminium packaging comes from recycled aluminium. Over 60% of all current European aluminium is made from recycled raw material. Recycling aluminium scrap in Europe saves 90 million tonnes of greenhouse gas emissions in a year – equivalent to the annual emissions from 15 million cars! Aluminium demand is projected to double by 2020. New techniques are always evolving to make thinner, stronger products using less material and less energy. Greater recycling will reduce energy consumption and CO2 emissions. The deposits of bauxite are sufficient for the next 300 years. Aluminium use in European cars continues to rise. Aluminium is here to stay!